John Mulherin, a former investment bank CEO, likes to say he flunked retirement. "I believe that as people age, they have a decision to make," he says. "That decision is: Am I going to allow myself to be put on the shelf, or am I going to put myself in a position to stay engaged and challenged?" After 35 years in financial services, banking, and money management, Mulherin, a Chicago native, retired in his 50s and moved south to South Carolina's Charleston area. Three years ago, he decided, "I'd like to learn a new industry," he says. "I looked at consumer trends and observed that one of the most pervasive trends is how disappointed and challenged most consumers feel about the simple act of getting basic car service and maintenance. To me, that is a tremendous business opportunity," he says. "I believe we need to improve the customer experience, and my idea specifically was convenience, which translates into one-stop auto care." Add to that a time when the average car is 7 to 7 ½ years old, and the post-recession consumer conservatism that has people preferring to live without car payments, and Mulherin was convinced this was a good industry to enter. He signed on with Driven Brands, choosing three brands for his one-stop auto care center in Summerville, S.C., Car Pros Plaza. 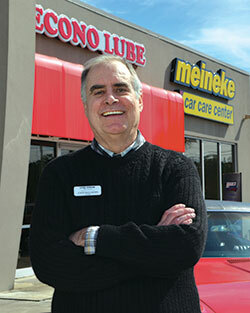 He chose Meineke for mechanical work, Maaco for painting, and Econo Lube for quick lube. "Putting all our capabilities under one roof saves people time and allows the business to create lifelong relationships," Mulherin says. Three years in, he's pleased with how things are going. "We have one of the highest car counts in the Meineke chain and high Maaco estimate counts. Our customers like the idea of a one-stop auto care center," he says, and he plans to open several other centers in the Greater Charleston area. Mulherin, a self-described serial entrepreneur, was a Gloria Jean's Gourmet Coffee franchisee during the 1980s coffee craze, and in the 1990s was a co-owner, with his wife Lynn, of one of the largest alpaca farms in the Midwest. He attributes his deep-seated fascination with all aspects of business, owing in part to his work with Harold Welsch, a DePaul University Professor who started the nation's first small-business concentration. "Now every business school does it, but he was the pioneer," says Mulherin, who earned an undergraduate degree in political science and an MBA from DePaul. The franchisee, something of a Renaissance man in terms of his interests and pursuits, learned about hard work during his years growing up in Chicago's South Side. His first job, he says, was as a 13-year-old busboy at a wedding reception at a country club. "On my first day on the job, I dropped a tray full of glassware, dishes, and silver on a dance floor during the reception," he recalls. "It was a show-stopper. I got a round of applause from the 500 guests and a pink slip a few minutes later (they made me clean it up before they fired me). I was 13 years old and figured that I could only go up from there." I was a 13-year-old busboy paid 70 cents an hour at the South Shore Country Club in Chicago. Catholic education; U.S. steel industry growth and decline on the South Side of Chicago; various business mentors; athletic competitions and coaches in swimming and water polo; '60s events like rock 'n' roll music, Kennedy assassinations, King assassination and riots, Vietnam War, Woodstock, musicians such as Pete Seeger, The Kingston Trio, James Taylor, Beatles, Rolling Stones, Martha and the Vandellas, Temptations, Smokey Robinson, Linda Ronstadt; classical geniuses like Beethoven, Bach, Tchaikovsky; Chicago sports scene and heroes like Nellie Fox, Luis Aparicio, Walter Payton, Mike Ditka, Michael Jordan, Phil Jackson, and Muhammad Ali; U.S. economic trends of inflation and downturns; change in big company relationships with employees from long term to short term; 9/11; regulatory changes in banks, trends in U.S. capital markets, upheaval on Wall Street; today's government gridlock and the need for unity and compromise among Americans and our political representatives. Also, authors John LeCarre, Martin Cruz Smith, Tana French; business leader Ned Johnson, owner of Fidelity Investments; and U.S. leaders George Washington, Abraham Lincoln, and Franklin Roosevelt. 37 years of marriage to the love of my life and two beautiful, successful children. That's a bit of an oxymoron. Every decision has consequences, good or bad. Each is a learning experience and the sum of them all is who you are. No regrets. Up early, coffee and quiet time, check media for news/issues, go to the shop and work with customers and employees, return home to spend time with family, perhaps read and relax. Boating, aviation, scuba, spending time in Charleston, S.C., history and culture, various volunteer activities, and spending time with daughter, son, daughter-in-law, and new granddaughter. Swim, various aerobic and strength machines. Gang Leader for a Day: A Rogue Sociologist Takes to the Streets by Sudhir Venkatesh. The author has studied life in the notorious Robert Taylor Homes in the South Side of Chicago. With his primary contact a young gang leader, the author observed the gang leader's management and leadership, as well as the relationship between the gang and the residents of the projects. "Do or do not--there is no try." Yoda said that. It's all about results and judging people and organizations by deeds, not words. I remember watching the Watergate hearings and observing John Dean explain the "cancer on the Presidency." Eventually President Nixon resigned in disgrace, all because of petty deception and dishonesty. It occurred to me that a good life rule would be to always tell the truth. I have done my best here, and it works pretty well. Challenge, sweetness of life, providing for family, opportunity to make a difference. It all seems to work out. I don't have any rules here. Just returned from Cabo San Lucas, Mexico--fun in the sun. Business is all about execution. The best plans are worthless if you cannot effectively implement them. What gets measured gets managed; metrics matter. All small business is marketing; the absolute key to small business is differentiation and distinctiveness. The best team wins. Hire the best and train for success. Provide honest, balanced feedback to employees on a daily basis. Share rewards fairly and generously to build loyalty and commitment. Always operate honestly and ethically--there are no shortcuts, really. Engage, delight, and thank your customer--always. Give back to others in a meaningful way. Business profits are earned, but they are also a privilege. Recognize your social responsibility to community and humanity. Focused, flexible, situational. I keep perspective and have patience when appropriate. I'm impatient and demanding when necessary. I encourage and support, but require accountability and responsibility. I manage for results and use facts to make judgments. I believe in always knowing your competition and battling fiercely and in a smart way for your value proposition. Small-business ownership is a battle every day. Driven, demanding but fair, a little off-kilter, family oriented, plugged in, competitive. Take my current business to scale. We work from established procedures and agreed-upon goals. Compensation is directly tied to specific metrics that are discussed weekly. Creativity and risk-taking is encouraged, but we always return to the basic question: Are we achieving our agreed-upon goals? I am on the premises daily and interact continuously with customers and employees. A fully functioning business system, an effective positioning of the brand names, scale economies in select areas of purchasing such as paint and car parts, and leading expertise in all phases of the automotive repair industry. These purchasing programs do create real competitive advantage. In our paint and body shop, we are the clear price leader because of a unique production process geared to high volume and very low cost of materials. In our mechanic and lube shop, we feature earth-friendly oil products and are in the process of rolling out a nationally branded tire program with Cooper Tires. I am very satisfied with Driven Brands, the parent company, and the brands I have selected. I know and trust their leadership team. They have delivered on their commitments to me, and where there have been the inevitable problem situations, they have always made things right. Quality products, expertise and training where necessary, highly competitive pricing (but they don't always have to be the lowest), timely delivery, a fair returns policy, national branding, and co-marketing where appropriate and helpful. I regard vendors as business partners and strive to develop long-term relationships. This benefits both parties in most cases. Yes. Money is tight, but in one sense, the downturn has been good for our business. Consumers are keeping their vehicles much longer because they are paid for. An inexpensive paint service can do a lot to create a better look, or as we call it, "Do a "Maacover." Additionally, the more miles that are put on a vehicle, the greater and more extensive are maintenance and repair needs. We inspect any vehicle free, and we provide free estimates. We offer a wide range of choices for all services and allow the consumer to make intelligent trade-off decisions between cost and longevity. We offer a variety of financing solutions, and we survey our customers on the spot to determine if we are meeting their expectations and call later for follow-up feedback. Dramatically. About 20 to 25 percent of our leads originate digitally. Our marketing costs in digital are increasing and our print spend is decreasing. New tools to manage and monitor leads, interact with social media to effectively position our brand and actively market to grow share are business imperatives. We first ask existing employees for leads. We source through networking (often the best people are working somewhere else). We interview a candidate with two managers separately and compare notes, and we don't put much stock in references. We occasionally create a "tryout," where we will pay a wage for a day to see if someone can perform at our expected level. We have an Employee Handbook that we review and distribute to every employee. These are the "Rules of the Road." There are some serious violations for which an employee will be released immediately. There are other violations for which an employee will be documented and counseled, with an opportunity to straighten up and fly right. Our counseling system is progressive; three strikes and you are out. The franchisor does a good job providing training films, materials, and support staff in the shop on most of our core processes. We use a buddy system, placing an experienced employee in a position to train a new employee. Some training is very short term. Other training, such as movement into another job class at a higher skill is planned and developed over a longer term. We really try to encourage skill development and internal mobility. Swiftly and directly. In a small business, we all need to pull our weight every day. There is no room to hide, so problem situations are immediately identified and discussed. We encourage and require total honest communication in a respectful, professional manner. We all make mistakes--but do we learn from them? Repeat problems are documented and discussed. We look for immediate improvement. If so, onward and upward! If not, after three strikes we give you an opportunity to be successful somewhere else. Show me that you are not accountable for your actions. By traffic or, as we call it, car count or estimate count; by average repair order dollar amount; by top-line and bottom-line growth and customer satisfaction scores. I plan in 3-year increments; 36 months is about the limit of my vision. Things are getting better. The national deficit is decreasing as a percentage of GDP. National unemployment currently stands at 6 percent, which is a marked improvement over the past 24 months. Our area is experiencing significant job growth, and housing sales are picking up. But there is still great caution, and many of our customers are very tight for money. Yes. The South, particularly the coastal areas, is prime retirement country. Charleston is now the #1 tourist city in the U.S. Many new companies (the largest is Boeing) are making billion-plus capital commitments to plant facilities, technology, and people. We get very close to the customer, demonstrate value and need, and are flexible in pricing and tenacious in sales. No. Banks were lending like drunken sailors in the housing boom and are now overreacting. Good credit can sometimes get money, but marginal credits are quickly shown the door. A variety of specialty finance companies are around, lending at usurious rates. Small businesses in tight situations are greatly at risk. Self-funding, cash flow lending from banks, specialty lenders. Also, a West Coast company called Guidant is a specialist in creating a business 401(k) from existing 401(k)/IRA accounts. National and local banks, Guidant. We have a full range of health, vacation, and holiday pay as well as regular increases for performance. Our health plan rate quadrupled in 24 months and we dropped it as a result. Under the Affordable Care Act, because of our size, we are exempt. We retained a specialist to meet with each employee, and 100 percent of our team has entered the South Carolina state pool and obtained good coverage at much lower rates. In some cases they have qualified for assistance, which in my view is a good thing. We try to create a career path. Our shop has different positions with varying skills. We provide training and promote upward mobility. We construct most pay plans with base hourly or salary and a commission plan to promote and reward behaviors that generate revenue. We interview from within for existing positions as a first plan of recruiting before we go outside. It's too early to say at this point. Ideally, a sale to existing management. I'm still working on it.